If you are not familiar with halloumi, you’re missing out big time. 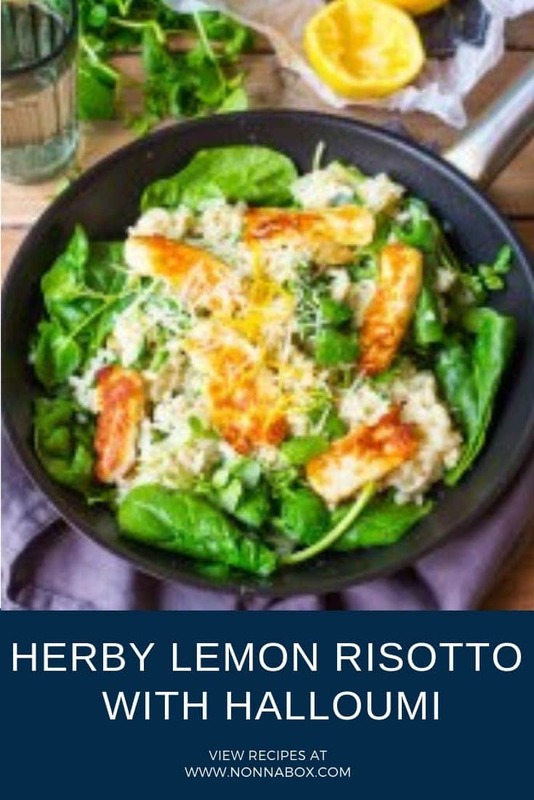 If you are a cheese lover like myself, you need to try it out and what better way to get familiarized with its taste than through this herby lemon risotto with halloumi recipe. I am the least pretentious person when it comes to cheese: I will try out anything, even if that means eating blue cheese or other types that smell really really bad. I don’t smell-shame cheese and in this case, I actually have every reason to recommend the halloumi. It originates from Cyprus and the reason why it’s an optimal choice when it comes to risotto is its firm texture, which is maintained throughout the cooking process. It has a mid salty taste which goes fantastically well with vegetables, like we have in this recipe. What’s not to like? Heat 1tbsp of oil in a large pan, add the onion and cook for about 5 minutes until the onion starts to go translucent. Put in the garlic, stir and cook for a further minute. Add in the rice and stir until the oil has coated the rice. Add in the wine and stir. Wait for the wine to almost fully absorb (stirring regularly) and then add the stock a ladle at a time - ensuring each ladle has almost fully absorbed before adding the next. Ensure you stir regularly. This should take approx 15-20 mins. Once you've used up all the stock, have a taste of the rice. It should be softer, but still have a bit of a bite to it . If the rice is still far too hard, you can add in a ladle or so of hot water from the kettle. Once the risotto is cooked, turn the heat down to very low. Heat 1 tsp of oil in a small frying pan and add in the halloumi. Cook on a medium-to-high heat for 2 minutes on each side until golden brown. While the halloumi is cooking, go back to your risotto. Add in the parmesan, lemon juice and salt & pepper. Give everything a good stir then turn off the heat and gently stir in the spinach, watercress, basil and parsley. 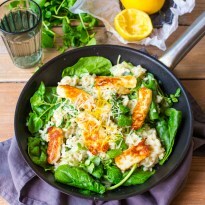 Divde the risotto between 2 plates and top with the fried halloumi. Serve sprinkled with lemon zest, a squeeze of lemon juice and some freshly ground black pepper. Okay so I love cheese so this recipe is my new favorite. Add herby, lemon, risotto, halloumi and it’s complete…. cheesy! Oh so yummy.